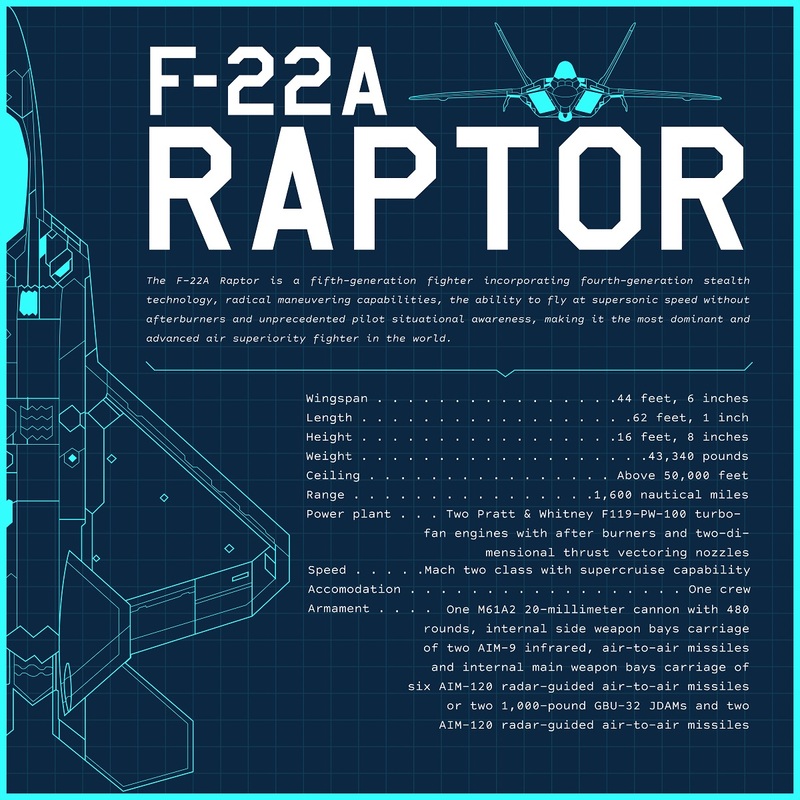 The interesting Infographic in this post provides some interesting facts about USAF premier air superiority fighter, the F-22A Raptor. As explained by Bennie J. Davis III, in the article Airframe: F-22 Raptor, the F-22A is a fifth-generation fighter incorporating fourth-generation stealth technology, radical maneuvering capabilities, the ability to fly at supersonic speed without afterburners and unprecedented pilot situational awareness, making it the most dominant and advanced air superiority fighter in the world. The Raptor’s sophisticated aerodynamic design, advanced flight controls and thrust vectoring allows it to outmaneuver any known aircraft. A combination of sensor capability, integrated avionics, situational awareness and weapons provides F-22 pilots with a first-look, first-shot, first-kill advantage over adversaries. The F-22A possesses a sophisticated sensor suite allowing the pilot to track, identify, shoot and kill air-to-air threats before being detected. Significant advances in cockpit design and sensor fusion improve the pilot’s situational awareness. The AN/APG-77 AESA Radar on the F-22 changes frequencies over 1,000 times per second to deter detection by enemy forces. Furthermore the AN/APG-77 emissions can be focused to overload enemy sensors as an electronic-attack capability. The Raptor’s ability to collect and share tactical information with legacy aircraft enables U.S. and allied forces to engage targets with unmatched battlespace awareness. With the data processed with the Raptor’s advanced avionics sensors and radars, the aircraft can even designate targets for allies.